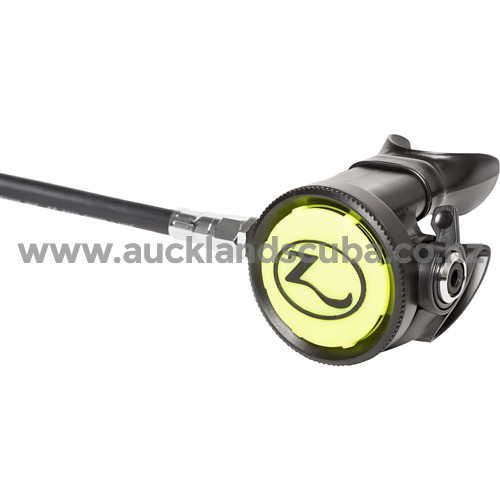 The economical Zeagle Envoy Octopus is the same internally as the ZX 2nd Stage, but is more compact and lighter because it does not have the adjustment knob or the heat exchanger. The Envoy Octopus has a venturi control lever that allows the diver to set the octopus 2nd stage in the pre-dive position until needed. This is very important in octopus regulators, since the pre-dive position is much more resistant to venture free flows that can sometimes result in significant air loss during a dive. The makes the Envoy Octopus a simple, lightweight choice for diving. The Envoy Octopus has a dependable downstream demand valve design for easy breathing in an out-of-air situation. The Octopus weighs 6.6 oz (187 g) without the hose and is made from brass, flexible and ridged thermoplastics, elastomeric polymers and silicone rubber. The Envoy Octopus comes with a yellow cover for easy identification and 36" (91.4 cm) 3/8" threaded hose; owner's manual.